Binary Defense approached Ingram Micro because of its impressive market reach, its unrivaled agility, and its deep understanding of next-generation security solutions. 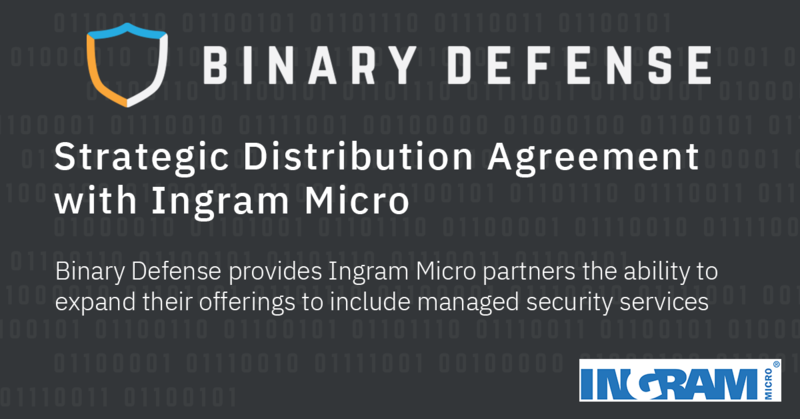 Under this new distribution agreement, Ingram Micro’s extensive network of channel partners will gain easy access to the innovative Binary Defense Vision Platform, which can identify suspicious behaviors, perform automatic analysis and investigation, and prevent attacks from ever happening. Follow @Binary_Defense on Twitter, our LinkedIn, or our Facebook page to hear the latest news and updates from the Binary Defense team. For more information about Binary Defense, please visit our www.binarydefense.com website. Binary Defense is the full-service security partner you wish you always had—real people, detecting real threats, in real time and a global leader in advanced managed security solutions. It will manage every aspect of your endpoint security environment, rapidly identifying and isolating endpoint threats to stop breaches and keep you secure. The Binary Defense minimalistic nano agent installs in seconds with zero user impact and provides instant visibility and best-in-class protection across your entire enterprise. Experience advanced endpoint software and the best consolidation of technologies in the industry to predict, prevent, detect, deceive, and respond to keep your company armed, current, and adaptable to all next-generation attacks. More at www.binarydefense.com.